Josie's Juice: 'Turbo' - DVD Review and Giveaway - 20 to win! 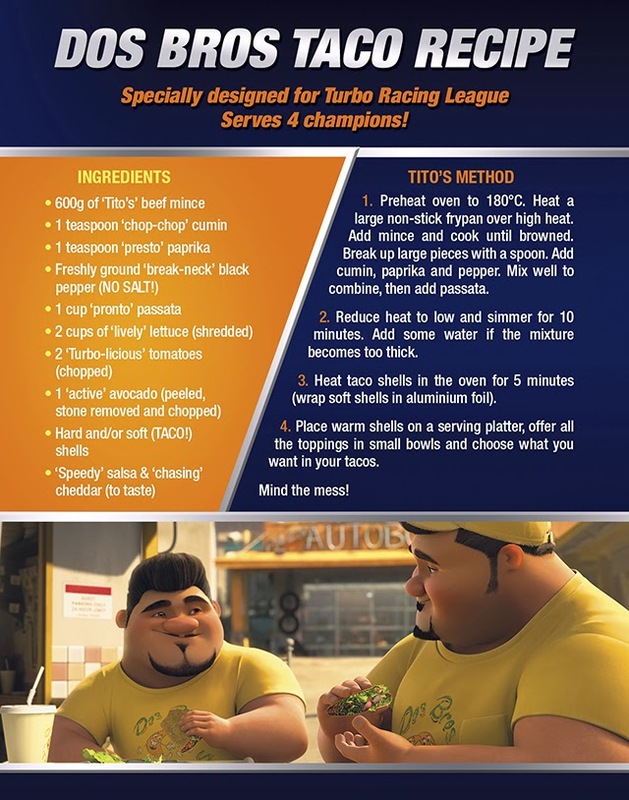 The 'Turbo' DVD release is here! 'Turbo' is available for download right now (from March 5), and it arrives on Digital HD on March 5 and on Blu-ray 3D, Blu-ray and DVD on March 12. We've just had our own little home premiere of the new DVD - via the fabulously immediate digital download - and it was, by all accounts - a really fun flick. Says Estella, 6: "It was really fun! And I loved the characters… Turbo was my favourite, because he's just really cool. He was slow at first, and then he was given special powers from a cool car. At the end he lost his power, then he got his power back! It was awesome!" You can often download Digital HD versions of the movie before the physical versions are available in the shops (Turbo is available a week before Blu-ray & DVD release). What's more, you can get it for the kids as soon as they start asking you for it, instead of waiting until you're next able to pick one up. Saves all that pestering! It's great for road trips and family vacations, because Digital HD downloads to all your platforms, meaning you can watch it anytime, anywhere. The finished result - fresh tacos... YUM! 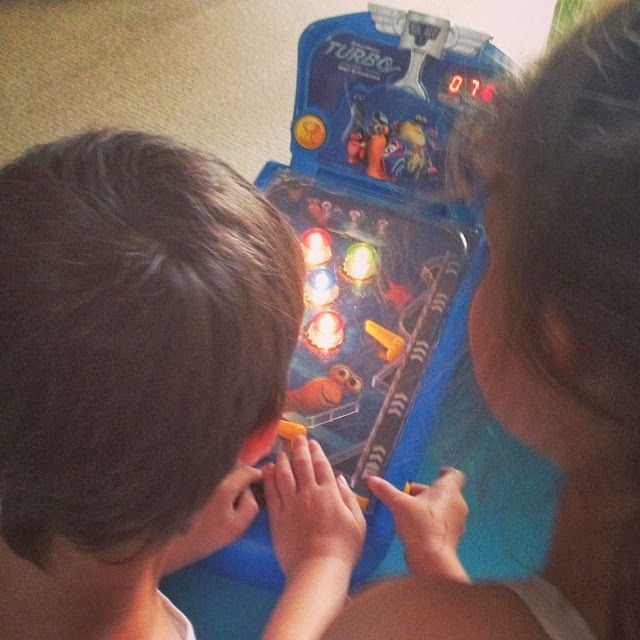 After a Taco-gorging dinner, the kids played with the Turbo pinball machine… score! They mastered it! Directed by David Soren and from the team behind 'Madagascar' and 'Kung Fu Panda', it's one of those perfect for kids and adults and kidults kinda flick, and features LOL-worthy voices from Ryan Reynolds, Paul Giamatti, Michael Peña, Snoop Dogg, Maya Rudolf, Michelle Rodriguez and Samuel L. Jackson. When you watch the flick, you can share your own review using the hashtags: #turbomovie #digitalhd #20thcenturyfox. Oh, and when you buy 'Turbo' on DVD or Blu-ray at Woolworths you receive a bonus Dreamworks Hero card! You can often download Digital HD versions of the movie before the physical versions are available in the shops. The best bit is that it's the Digital HD downloads to all your platforms, meaning you can watch it anytime, anywhere, on any device. No pestering parents to buy it at the shops… and, it's a week early! The Blu-ray release exclusive special features include Smoove Move’s Music Maker, and you can watch action-packed music videos featuring songs from the film. Another extra? You get to 'meet' Tito! And director David Soren provides an introduction for a scene that was deleted from the film. David Soren also gives an introduction for a storyboard sequence that eventually made it into the film. Viewers can even see picture-in-picture comparison to the final cut. Extremely cool for young movie buffs. You can also create your own shell from select-able parts. Additional special features: Champions Corner, where host Paul Page interviews Turbo one-on-one to hear all about his racing techniques and inspirations. Dave Burgess, Head of Character Animation on the film, shows the audience how to draw: Turbo, Whiplash, Skidmark, Burn, Smooth Move, White Shadow, Chet and customisable Racers. You can also see Turbo and all the rest of the snail crew in a break- down of the cool components that make up each of their shells. So, how to win a copy? Here's all you do! 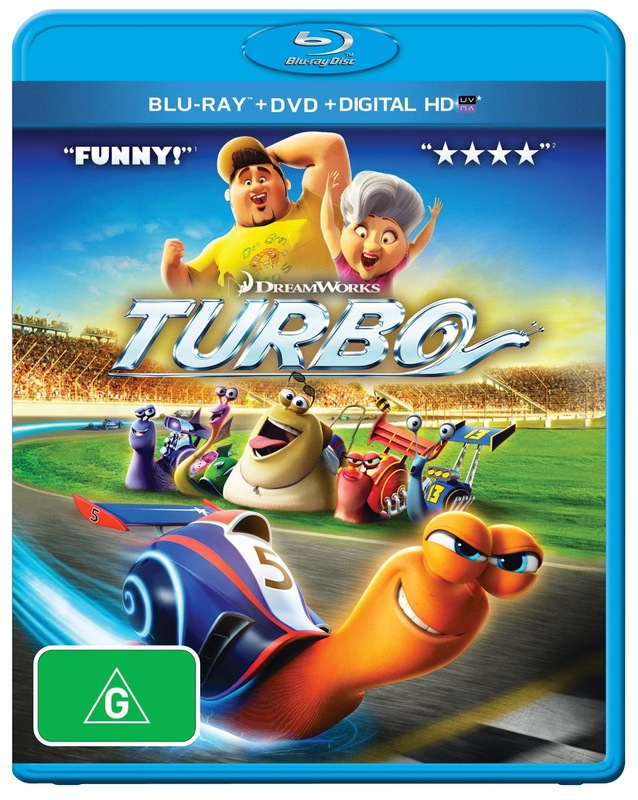 'Turbo is available on Blu-ray, DVD & Digital HD March 12' and via download right now.